Firm Overview Alyssa M. Clemente Esq. Alyssa Clemente joined Laufer, Dalena, Cadicina, Jensen & Boyd, LLC in September 2016. Ms. Clemente has extensive experience in family law, and her practice has been devoted solely to family and matrimonial matters since she began practicing in 2012. She is admitted to practice in both New Jersey and New York. Ms. Clemente graduated from Seton Hall University School of Law in 2011. While there, she received the Student Service Leader Award, and the Outstanding Clinical Practitioner Award for her participation in the Family Law Clinic. Following law school, Ms. Clemente served as Law Clerk to the Honorable Richard M. Freid, J.S.C. in Family Division, Passaic County. 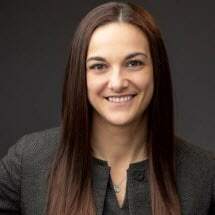 Ms. Clemente is a member of the New Jersey State Bar Association's Young Lawyer Division, the Morris County Bar Association, the Barry I. Croland Family Law Inns of Court, and the Morris County Chamber of Commerce.